Using Yahoo App Publishing, you can create Video Ad Units and Rewarded Ad Units. To create a video ad unit, follow these steps. Select the app for your ad unit. Select the Standard type (assuming you are not creating a Rewarded ad unit). Select your Ad Details. To run only video, deselect Static and Rich Media. Decide your CPM floors for your video ads. This is the minimum amount you want to earn for every 1,000 impressions served (eCPM). For video, Yahoo recommends a floor of ~$5-10. Note that you can modify your floor prices at any time if you want to wait and see how your ad performs. Leave blank to let Yahoo optimize your floor. 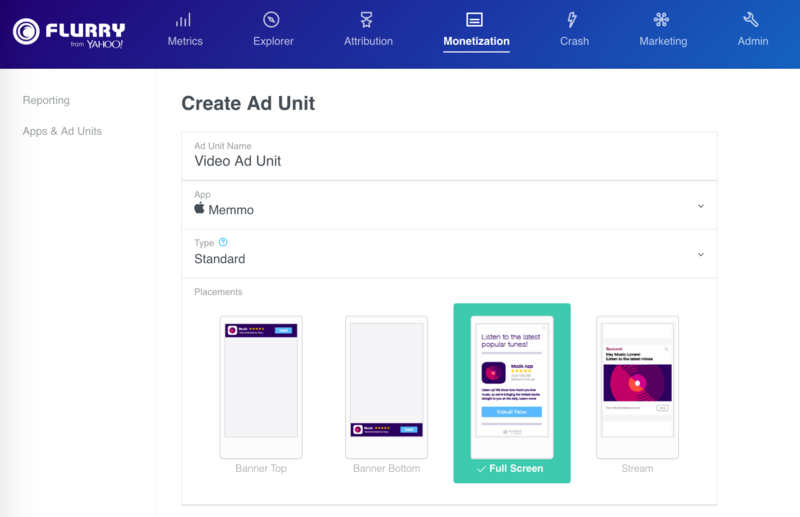 You can now save your ad unit. Look for a green success banner at the top of this page to ensure your ad unit has successfully saved. Should it not save correctly, you will not be able to retrieve ads later on. Clicking “save” again should resolve this issue. Use the latest SDK to ensure that the latest video features are included in your app. Length: You can choose to allow videos of virtually any length in your ad units. Skippability: By default, ad units are non-skippable video ads because this performs best for publishers. Publishers can make ads skippable or skippable if the length is greater than 15s. You can also set up Rewarded Video ad spaces.